Again there appears to be little obvious information to go on. However, two engines - does that help ? The three leading vehicles are 21ft 0in horseboxes. Remainder of train looks like 30ft 1in stock. Engines are an Experiment (with handrail/blower control rod above the ejector pipe) and a Jumbo. Location � who can tell? 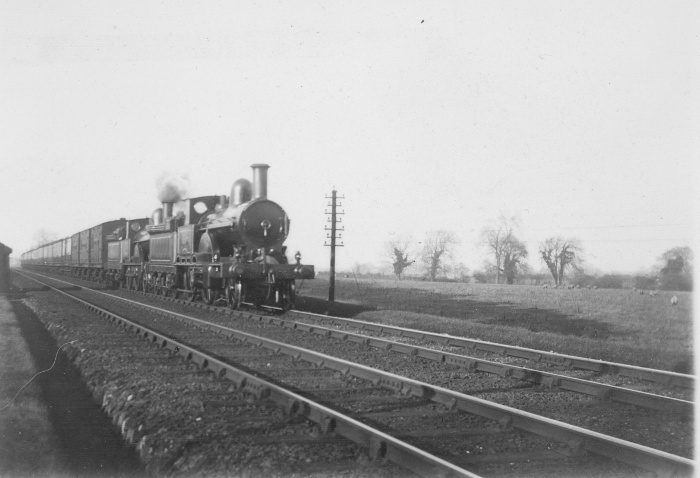 Wild guess � the featureless countryside and deep drainage ditches may be at Moreton�s crossing (north of Crewe) before the line was widened. Is that the outline of a signal cabin on the left and what appears to be a boarded foot crossing?